So I’ve only ever had male veileds. I’m considering getting a female to either possibly pair with my current male or just to rescue like I did my boy. In all honesty, the main reason I want a female is to just have another adventure! I’ve rescued reptiles my whole life. I’m chronically ill and have nothing else to do while I’m home all day except take care of my chameleon. I’d love to get another one because it’s seriously became a passion of mine to help these little sweet beings. I’ve obviously looked over all the care sheets I possibly can and have talked to friends with females but I’m honestly looking now for everyone’s personal experiences and advice, if that makes sense. And of course more care sheets you think are amazing to look over for female care. I will be honest in the fact that I DEFINITELY was not fully prepared when I got my boy, despite how prepared I thought I was. I learned very quickly that they are MUCH more of a challenge than what is written on paper and just fell in love it it. But this time, I wanna make sure I am fully prepared. Lemme just say, females are a bit shy. You have to try hard for them to trust you. But, they are loving all the same. As for space, you can have a smaller enclosure because they are alot smaller than males. I saved me some money to get a 18x18x24 instead of 18x18x36. Personally, i like the females color patterns better than the males, with the orange and turquiose spots when angry. Females are unpredictable when it comes to egg laying, you have to monitor their behavior closely for this reason. I have enjoyed having my female as my first chameleon and encourage you to follow through with your plans to get one. Thank you so much! I love their color patterns too! I actually have an extra cage that I’m pretty positives is 18x18x24 so I’m glad that’ll work. If you are pairing them... 1) separate cages correct? They sometimes get along but mostly you wind up with the female being too scared to eat and drink. 2) you will likely spend more money on them than when / if you sell them all. Veileds sell mostly because they are cheap. Oh yes definitely separate cages. I honestly don’t care too much about the selling of them as I do just having the experience, so the money doesn’t mean much to me. I of course would sell them because no one has the room for that many chameleons (and if they do, bless their heart!). If I do pair them, i just wanna do it to have the experience. Though we don't exactly see eye to eye on the other thread, I'll add here. You've already covered part of one of the best pieces of advise I've read given to a "new inspiring breeder". Go into it for your love of chams and not with the idea you'll make a ton of money doing it and be willing to learn along the way. Things change and I am a firm believer in doing your best to keep educating yourself on husbandry changes that are happening. Take for instance hydration practices, when I started building my first cage last Oct the common and accepted practice at the time was day time hydration and night time dry out. Six months later there is a new husbandry practice being put out on hydration by Bill Strand and Petr Necas. My wc male Odin came in shortly after they came out with it and I've had him on that method since being here for the last five or so weeks. I plan on moving the rest of chams to that practice as well now. That being said, don't go into it planning automatically to short change your female of needed cage space. Of my currently six female panthers, one is as large as a small male and is in a 24x24x48. The rest are in typical 18x18x36 cages. My biggest suggestion if you are serious about it, try to find a veiled breeder that will take you under their wing like @Matt Vanilla Gorilla did for me and my panthers when I decided I was going to breed. I actually bought the sire of my two incubating clutches, with hopefully a couple more clutches to come in the next 4 to 6 weeks, from him. I've already stressed how important the doing your research is on two different threads now but, a mentor if you can find one willing to help you with veileds, is just as invaluable. 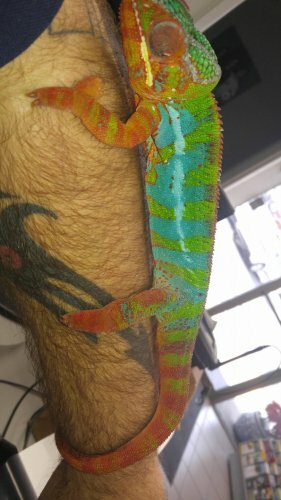 Matt went from my first boys breeder to my mentor to mentor and friend to my long lost older brother from another mother that just happens to be a panther cham encyclopedia in a very short time span . We share stuff we find in our research that we think is interesting. I have a very small female veiled (only about nine inches) so 18x18x24 is plenty for her. You're going to upgrade her cage when she gets bigger, right? It wasn't a dig at you this time lol. Though I wouldn't mind seeing her. This is your 1.5 yr old one? Since the thread was labeled as "your personal experience" just figured I'd share that some females will get large. To give you an idea of why I bring that up in particular, I don't recall if I've shared these pics publicly or only privately so here it goes. Bort is probably my largest male atm. I'm hoping for Odin to surpass him being wc but that'll remain to be seen. Anyway, here is Bort and Frija lol. As you can see, if Bort backed up a touch in that pic his body alone is nearly as long as my forearm. And, Frija compared to him in the maple. I don't personally own any egg layers (sp?) but I do have a caution and an idea for you. Veiled females easily lay clutches of 30 eggs at a time and with retained sperm can produce 3-4 clutches from a single breeding (not all will be 30+ eggs). If you just want to experience breeding without having to rehome lots of babies you could just select a few eggs out per clutch and humanely freeze the rest. If that is abhorrent to you I understand. Just buying eggs is possible if you just want to raise babies. Some people will sell freshly laid eggs during a very short window they can be safely shipped. Be sure of the ethics of whomever you get them from so you don't buy sterile eggs. If you do buy a female try to get one that you see the sire has good colors so you breed veileds of quality. Buy from a reputable breeder because healthy females have a better chance of surviving egg laying. I know how hard it is to find experienced breeders who are willing to help share their knowledge! A part of it is the fact that one will often get slapped through the face (figuratively) for your attempt to help! Your good intentions and desire to help others can easily be misinterpreted as rude, snobbsh or that you act like a know it all! After a while one feel tempted to get desensitized and to say to yourself "why help, people don't even appreciate it and will turn right around and stab you in the back!". When ever someone offers advice to another the person on the receiving end is fragile and can very early be made to feel "stupid", picked on or overpowered! Even if it was not intended as such! They then will most likely retaliate and boom, the bomb goes off! I am very aware of these potential issues, risks and humanity flaws and do my best not to take things personal! I pick my battles and try to ignore threads where a war is raging! Lol. 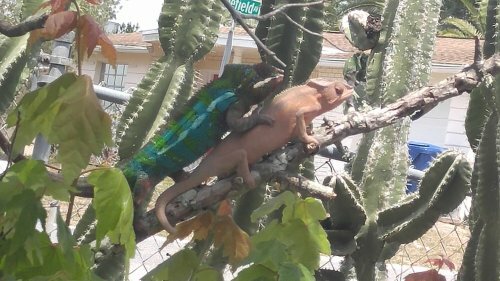 I try to remember that the other person is most likely quite the incredible person if they are here on the forums trying to ask for help or trying to offer help and also have chameleon love in common with me! I have also found that if/when other people and I put our differences aside and work at "getting over it", it is quite possible and one could gain quite the friend! For me, @dshuld is quite the find (nope we never had a raging war between us, lol. We started off with friendship)! Helping and guiding him turned out quite serendipitous! I have gained more than just friendship in getting to now you sir! It is a honor to know you! People, keep a eye on this one! @dshuld is quite the up and becoming breeder who is sure not to dissapoint your expectations! Thank you!! You and Jessica have been wonderful friends to us. Both Krissy and myself truly appreciate everything you two have helped us through as new owners and continuing our research together. I don't think her and myself would've ever grown as quickly in this sub of the reptile hobby as we have with out you two by "our sides". I used to have a female veiled chameleon. She was the sweetest thing ever and always loved to come out of her cage. Unfortunately she passed away 5 months ago and I have a male one still that’s still growing. Honestly I liked the female more because she was so much nicer than my boy in my opinion. I think you should definitely get one! Welcome @makkatfloof exciting times thinking of little girls veiled . Female veiled are the best . You have some really amazing keepers on your thread giving advice. I want to say I am not a breeder and I’m a newer keeper but do have 2 female veiled . I also want to say with my experience keeping both veiled and panthers they LOVE space go bigger . No you don’t have to but they will be happier . @jannb is the queen of veiled hands down !. Quiz her get all the knowledge you can Jann she is sweet , kind and SO knowledgeable . Jann has been keeping veiled for a very long time . If you happen to change your mind and go with a panther female I’m going to tell you the same Matt and Jessica !. @Matt Vanilla Gorilla @Teal Beauty . I’m going to second @dshuld Matt and Jessica are absolutely amazing . Tou will have amazing friend for life . They have been guiding us for a year and a half . I have a very handsome boy nosy be Septiseye . Also recently successfully hatched five eggs of Matt’s and Jessica . I could not have done it with out them . Welcome @makkatfloof exciting times thinking of little girls veiled . Female veiled are the best . You have some really amazing keepers on your thread giving advice. I want to say I am not a breeder and I’m a newer keeper but do have 2 female veiled . I also want to say with my experience keeping both veiled and panthers LOVE space go bigger . No you don’t have to but they will be happier . It is so amazing that those little eggs can travel that far safely with good Packaging! I always feel so happy when I hear that the eggs I sent people hatched! Thank you for that Kristen! It is our honor to serve! Oh yes but you already knew that . You knew that those precious eggs would be Just fine . Along with my ability to successfully hatch them then care for them . Thank you for trusting in me !.